College students tend to flock to dense, urban areas after graduation, seeking the types of skilled-labor jobs that are most widely available in large cities. So it makes perfect sense, then, that London—the biggest city in Europe, with a population of 8.6 million—has the highest concentration of college-educated people in Europe. What’s far more surprising is just how vast the gap is between London and other cities. 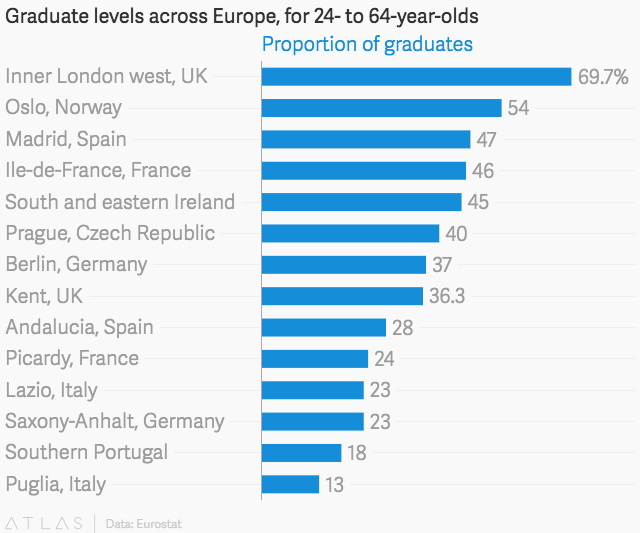 According to new figures this summer from Eurostat, the European Commission’s statistics group, some regions within London boast concentrations of working-age graduates as high as 69.7%. By comparison, one of London’s closest European rivals is Oslo, Norway, which has about 54%. Paris has about 46%, and Finland—a country often regarded as an international paragon of higher education—has a concentration of 51% in its capital of Helsinki. A few key things stand behind London’s lead. England already performs relatively better in college education than many other European countries, and then there’s the position of London as a massive social, economic, and professional hub for the continent as a whole. A BBC analysis shows that education levels dip dramatically even when venturing just a few miles outside of London: the nearby county of Kent, for instance, only has a 36% level of working-age graduates. Given these numbers, you might expect to see similar set-ups (in which the biggest cities draw the biggest number of graduates) in other parts of the world. But that isn’t actually the case. In the US, according to a Wallethub study last month, the most educated city is Ann Arbor, Michigan, followed by the Washington, DC area and the San Jose-Sunnyvale-Santa Clara (a.k.a. Silicon Valley) hub in California. A scattering of other small cities—like Madison, Wisconsin and Tallahassee, Florida—comes next. New York City, the country’s most populated city, only clocks in at 37th on the list. Los Angeles, the second-most dense city, is 85th. The discrepancies here have to do with the immense size of the US, and the ensuing tendency for people to cluster in local hubs of education and commerce rather than uprooting their lives to one central area, as is the case with London. In addition, the US’s best-performing universities are peppered around the country, instead of squeezed together in one or two areas. Oxford and Cambridge are short distances from the capital, while London’s universities are on an unprecedented $6-billion expansion. All of which is to say that London’s standing as Europe’s most educated city is a wholly unique one. Over in Asia, Singapore, which is frequently ranked as one of the most innovative and technology-focused countries in the world, has a proportion of young people attending college that hovers at around just 27%—showing that even city-states designed to attract global talent struggle to compete with London and its enormous advantages. While London’s educational triumph may be great news for the city, it also spells trouble for surrounding regions in the UK and other nearby countries. For as the geographic polarization of college graduates gets more and more pronounced, so, too, do gaping problems of inequality.